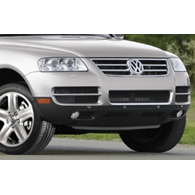 (autoinsidernews) - Volkswagen announced pricing for its 2006 Touareg V10 TDI, which is now available in showrooms. The 2006 Touareg V10 TDI is the first turbodiesel light-duty vehicle available in the U.S. featuring a particulate filter to reduce emissions. The TDI engine uses ultra low-sulfur fuel and meets strict emission requirements in all 50 states. The 5.0L V10 delivers 310-hp and a whopping 553 lbs-ft of torque, and gets up to 30 percent better fuel economy than traditional gasoline engines, reports Trend. The 2006 Volkswagen Touareg V10 TDI has a starting base price of $67,750. Standard equipment on the diesel Touareg includes six-disc CD changer, navigation system, Park Distance Control, keyless access, power height-adjustable telescoping steering column with memory, power height-adjustable front seat belts with memory, four-zone climate control (Climatronic), heatable rear seats and silver roof rack and rails.